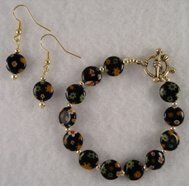 Our bracelets and earrings are made with the finest quality Chechen and Lampwork Glass, Swarovski Crystal, Fimo Clay and Sterling Silver Beads. 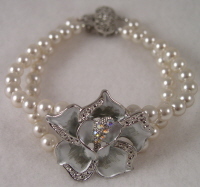 See the link "about our products" for instructions on how to determine your wrist size when ordering bracelets and watches. 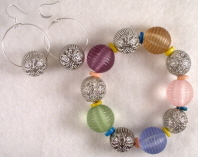 Also, charms such as crosses, ladybugs, cupid, hearts and Breast Cancer pink ribbons can be added to any watch for free. 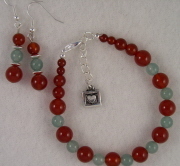 Just let us know when you place your order and we will add the charm. 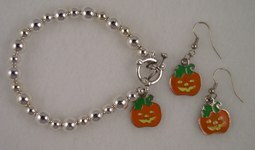 To see the variety of charms available, please click on the "Charms" link on the Home Page. 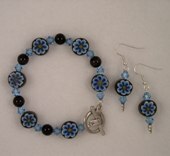 Bracelet and Earrings made of Fimo Clay beads. 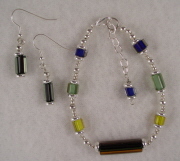 Bracelets and Earrings made of Furnace Cane Glass. 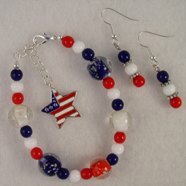 Click on the image to see our selection. 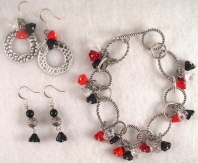 Holiday Themed Bracelets and Earrings. 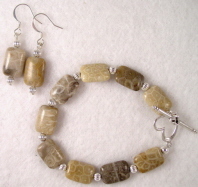 Bracelets and Earring made of Semi Precious stones.